On May 21st, 1980, the Club formed after meeting at TAFE library following a radio ad calling for anyone interested in sharing and learning the art of Spinning and Weaving. Later that year, the Club drafted its constitution and was officially named “The Northern Spinners and Weavers”. The club was formed with Sheila Roberson as President. We incorporated in 2002 and more recently the Club underwent a name change (Fibrecrafters FNQ Inc.) in order to acknowledge the diversity in textile related crafts that it now embraces. 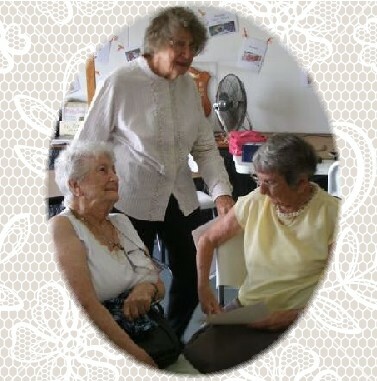 Sheila Roberson (left) Eileen Balle (centre) and Peg Manning (right). Some of these are basketry, weaving, fabric dyeing, bobbin lace, knitting, crocheting, spinning, tapestry weaving, tatting, jewellery making, felting and traditional as well as contemporary techniques in numerous other crafts. Beginners and learners are welcomed and encouraged. Sharing of information with multi-skilled members is available when requested. Regular craft days are conducted in our local area. Regular monthly administrative meetings are conducted and attendance is encouraged. Spinning wheels, looms, carding equipment, patterns, needles & equipment are available to members for hire at modest fees per month. Extensive library is available to members for modest loan fee. Workshops are conducted from time to time to expand the fibre-craft experience, both to members and the general public. Occasional contact with school students to promote fibre experience. Competitive exhibition and working display held at the annual Cairns, Atherton and Malanda Shows. Regional weekend workshop/craft expos are conducted for members and the public. Annual club craft weekends away are organized. Monthly newsletters containing current club information, items of interest and news from other forums are distributed to members. To create an interest in arts of crafts related to fibre - wool, silk, cotton, plant material etc. and spinning, weaving, lace-making, basketry , felting etc. To provide facilities and information to encourage members to reach a high standard. To enjoy participation in these arts and crafts and to assist others to do this as well.